and bought the Grange at Monifieth. David 3rd of Burnside who died 1699, left in his will to David 6th: Heir Special in Balskellie, Links of Barrie, Cowbyre, Coatside, Newgrange, etc. 1770 The late Mr Hunter of Blackness, by way of experiment, planted a large body of Scotch firs, they have thriven very well. 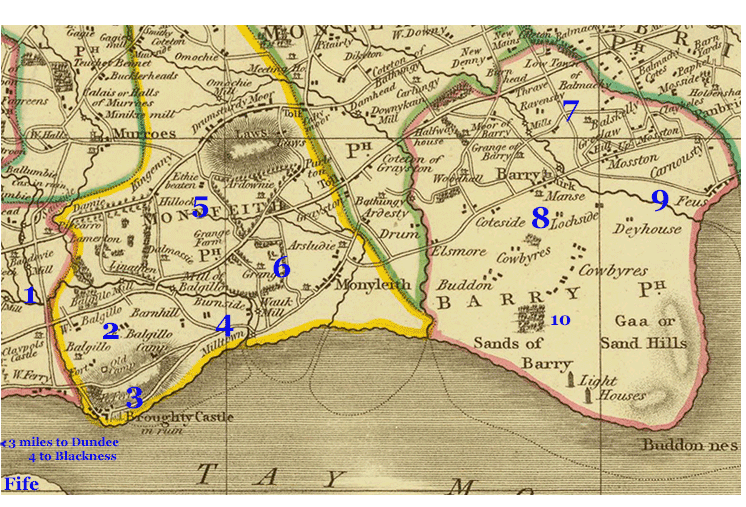 The Blackness story begins in the Parish of Barry (right side of the above map, outlined in pink). You will notice there is a lot of Hunter activity in this area around this time and as they are all related to each other, making it somewhat confusing to figure out 300 years later. In the index of Hunter wills there is an entry: Hunter - David, of Burnside, to his Father David Hunter of Burnside who died - April 1699 — Heir Special in Balskellie, Links of Barrie, Cowbyre, Coatside, Newgrange, etc.- Forfarshire — This is David Hunter the 6th of Burnside, inheriting from his father, David the 3rd of Burnside. Graham in his translation of Andrew of Dod's will says, "David, son of his brother", however in Grahams Burnside text he says "David, his younger brother's son". After spending a month trying to find out which is which I will have to leave it, as it is for now and get on with the rest of the pages. I suspect David (Merchant in Dundee) is David Hunter 6th of Burnside, before he inherited the title, but can find no record of him having a son called Alexander? The Parish of Barry is about three and a half miles wide by four miles north to south, about 5,400 acres. 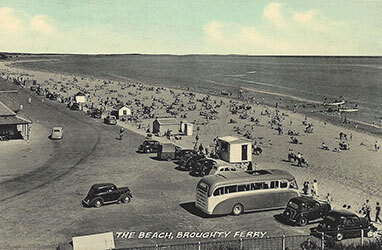 The lower third comprises mainly of sand dunes and the upper third is good farming land. The farm and estate of Balskelly (in days of old, sometimes referred to as Balskellie or Pitskelly) was the second largest farming estate in the parish at that time. The 1692 hearth tax shows David with five taxable fireplaces, second largest house in the parish and a nice size to start a family. Add on the Links of Barrie, Cowbyre and Coatside and also sometime before 1771 David purchased the property of Whitelumbs in Barry, which then made David the major proprietor in the parish. Quite a land-holding altogether, though on the same valuation in "The History of Arbroath Abbey" it quotes his kin, in the next Parish of Monifeith, General David Hunter of Burnside, as having property worth three times more, at Broughty Ferry. So still a way to go. David's son, Alexander Hunter, younger of Balskelly, was born 1710 and was to take the colonisation to the next level. He married Amelia Gardyne, of a very respectable land-owning family and co-incidentally, the niece by marriage, of David Hunter 6th of Burnside. She lived to the grand old age of 93 which was quite an achievement in that period. There must be something in the water because Ann, Alexander's sister of whom we will hear more later, died in 1852 at 103 years of age. 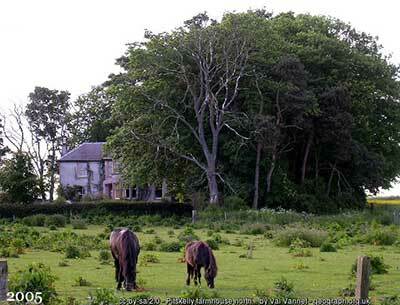 In 1739 Alexander Hunter, 2nd of Balskelly, purchased a nice property called Eskmount, 20 miles to the north, by Brechin. This was to become a family retreat, an agricultural testing site and a high society drinking den, more on it's own page. In 1742 Alexander purchased the Blackness estate which is 4 miles to the east, along the coast and on the other side of Dundee. 1743 sees the start of the next generation with the birth of David Hunter 3rd of Balskelly, and 2nd of Blackness (younger). Meantime there is a new kid on the block, Alexander Gibson Hunter, born 1770. He was certainly a character who led a full, though short life. Deserving of his own page to illustrate some of his achievements. 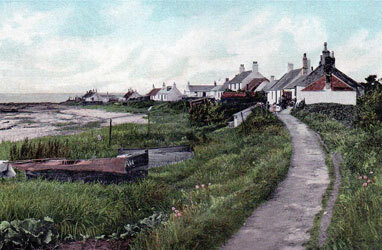 In 1792, A major William Philip, bought Carnoustie farm to the east. He partnered with David (3rd) in starting a new town, initially known as Taymouth Feus. 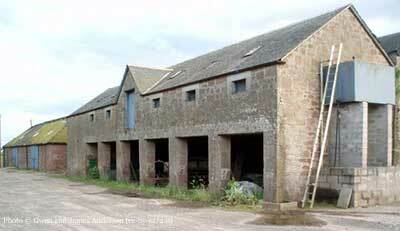 Carnoustie farm, was a reasonable size and David added an adjoining strip from Balskelly. It was just to the south of Hunter's Town on the map. Hunters Town was built around the same period, and there are still about a dozen of the original weavers cottages still standing. It must have been built by the Balskelly Hunters. 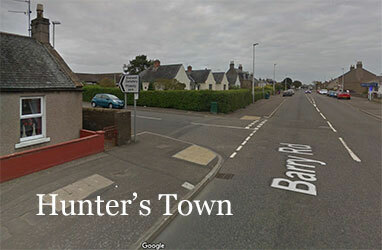 Located on what was the old coast road from Dundee to Arbroath (A930 nowadays), on entering Hunters Town, the left turn at the crossroads is the entrance road to Balskelly (half a mile). 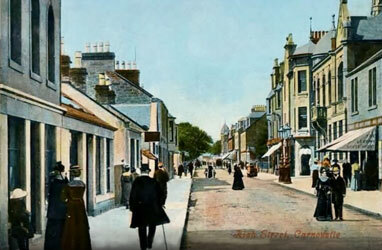 It has now been absorbed into the new town of Carnoustie. David the third of Balskelly and second of Blackness died at Eskmount in 1809. Alexander Gibson Hunter ties up his affairs in Edinburgh and moves to Blackness to run the family empire but died himself three years later. aged 42. His son the next heir David Hunter of Blackness, Eskmount and Ballskelly, was only nine years of age. 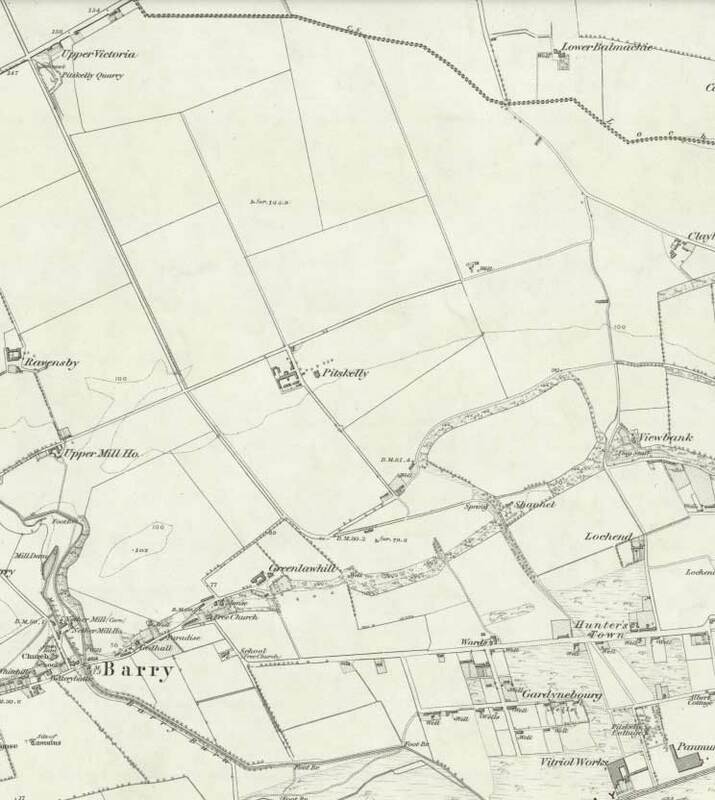 On the north border of Balskelly estate is a small hamlet called Upper Victoria, comprising the Balskelly quarry, Victoria Cottage, where David Hunter of Blackness (Alexander Gibson Hunter's first born) lived at that time, and a few other workers houses. The Hunters owned and ran Balskelly quarry, which initially supplied the stone for the new houses. When the rail-road was built through the parish in 1837, David treated himself to a new steam engine and some wagons. He built a spur track from the main line, which he named Lower Victoria, right up to Upper Victoria so he could easily and quickly transport the new "invention", and much in demand, stone railway sleepers to market. "In 1834, the invention of the world’s first effective stone-planing machine by James Hunter, quarrymaster at Leysmill, revolutionised the working of flagstone" I have not connected James to David yet but assume they must be related, being of a similar age and living only 10 miles away from each other, David would have known of him. This may have influenced David's decision, but unfortunately Upper Victoria stone wasn't of a high enough quality to capitalise fully on the idea. More on James and his inventions, when I get time later. 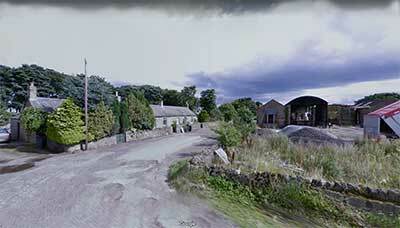 By 1844 the farms around Ballskelly and at Blackness were let to tenants and Eskmount was sold. Dundee Advertiser 13 Sep. 1844: .. also the Game on 1400 acres adjoining, with a good house; also a small Salmon Fishing, with an Ice House .. The Elgin Courant Friday August 5 1853: SALES of LAND.—The fine estate of Pitskelly, in the county Forfar, belonging to David Hunter, Esq, of Blackness, was sold on Friday by public sale, in the Royal Exchange Coffeehouse, Edinburgh, for £42.000. Not that there is much of Hunter interest left nowadays to see but still sad to notice in the last three years the coming and going of planning applications, it seems likely that soon there will be 600 - 750 houses built over Pitskelly. This map shows part of the area in 1860. 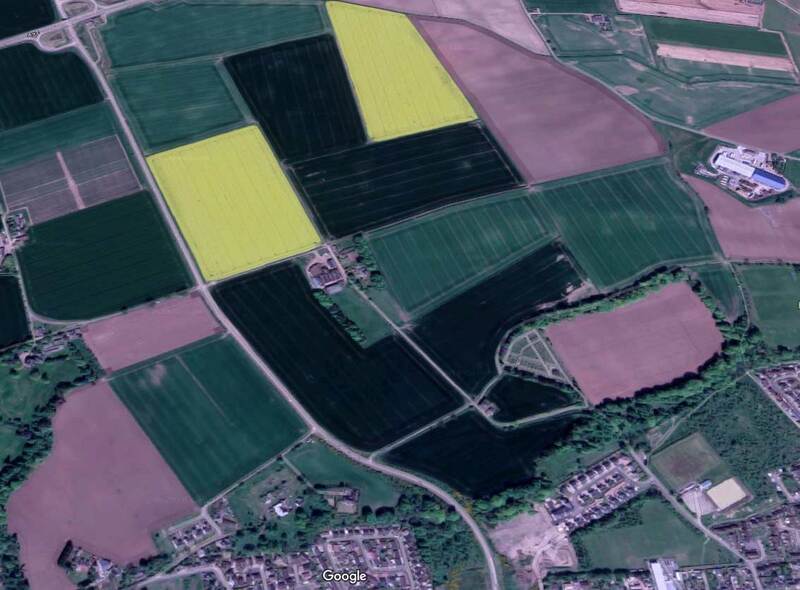 Top left is Upper Victoria quarry, Balskelly (Pitskelly) in the middle with Hunterstown lower right and part of the Dundee to Aberdeen railway bottom right corner. Balskelly still farming today, just without Hunters. Upper victoria is now an interchange on the A92 road.